Women Keep Up To Date With Trends In Order To Stay "In The Know"
Nearly everyone enjoys being seen as the person in their circle of friends or peers that is aware of popular cultural trends before they become over saturated. As part of the POPSUGAR Insights Content, Commerce, and Culture study, we surveyed over 1,500 women between the ages of 18-44 and asked them to share their motivations for staying aware of popular trends. 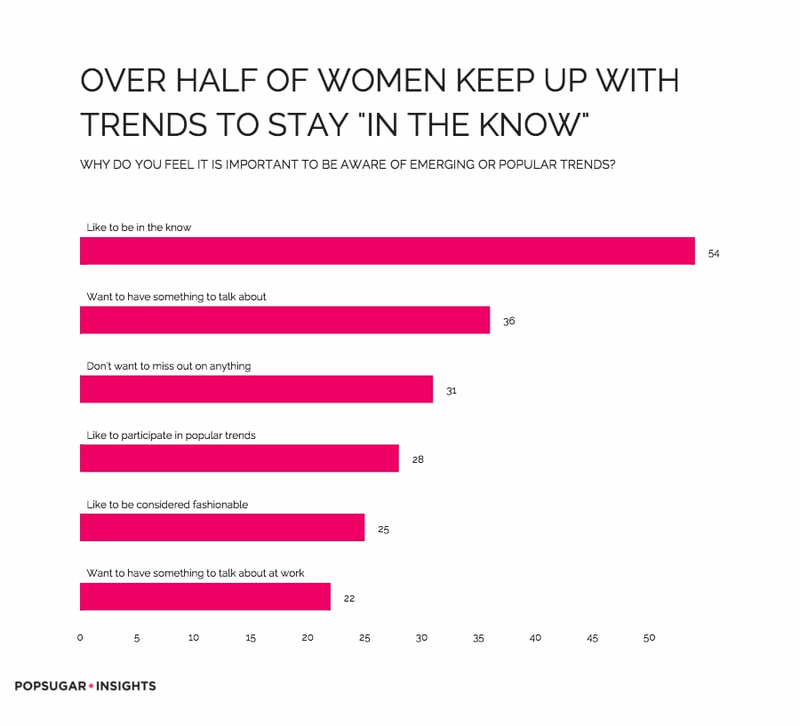 For over ½ of women (54%), it's important to stay aware of popular trends because they generally "like to be in the know". Thirty-six percent of women stay aware of trends because they're looking for conversation fuel to "have to talk about with friends and family". Another 31% of women are obsessed and say they "don't want to miss out on anything". Twenty-eight percent of women say they enjoy "participating in social trends", and 1 in 4 women say they like to "be considered fashionable". Emotional aspects play somewhat less of a factor, with 18% of women saying that "it makes them feel cool". Just over 17% of women say that "the opinions of others matter to me".